ATLANTIC HIGHLANDS, NJ-​ With Valentine’s Day and the winter months upon us and the hustle and bustle of the holiday season finally over, we tend to forget that hunger in our community has no season. The staff and family of Bayshore Pharmacy is proud to sponsor SHARE YOUR LOVE – SHARE YOUR PANTRY​ food and household supplies drive for the United Methodist Church of Atlantic Highlands. Longtime pantry volunteer Helen Marchetti is grateful to our community for their continued support of the food pantry throughout the year. “Every can of soup, every can of vegetables and every box of pasta goes a long way to feed a family in need. Your generosity is always appreciated. 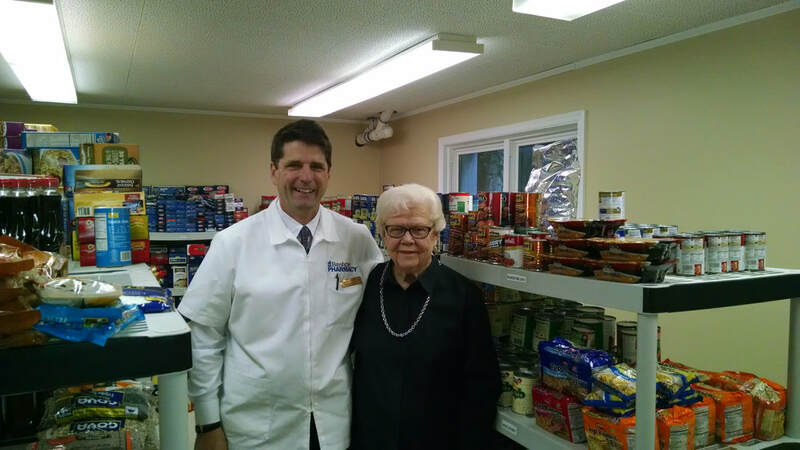 Food drives sponsored by local businesses like Bayshore Pharmacy provide a boost for our shelves and raises awareness of the need for this pantry in our community.” The food pantry is especially low on: coffee, paper towels, toilet tissue, small clothing detergents and dish detergent. The United Methodist Church of Atlantic Highlands hosts the Food Pantry for the Area Association of Community Churches. The food pantry is located in the church basement and is open Monday – Wednesday – Thursday 9:00am – 11:15am, serving the immediate area from Sea Bright to Port Monmouth. Bayshore Pharmacy Cards and Gifts, located in Atlantic Highlands, is a locally owned, full-service pharmacy, specializing in compounded prescriptions, immunizations, and insurance billing. Serving the area for over 50 years and two generations, Bayshore Pharmacy also provides the area’s largest card and gift shop offering plenty of parking and delivery service. ​Please contact the pharmacy for more details: (732) 291-2900. The finalists were pharmacies who exemplify what it means to be a Good Neighbor Pharmacy in their commitment to enhancing patient care and lives in their community. They were evaluated on their ability to deliver exceptional patient care, provide innovative services, and show a strong commitment to the local community. Good Neighbor Pharmacy is a nationwide network of over 3,200 independently-owned and operated pharmacies. While your local Good Neighbor Pharmacy is able to offer the quality products and value pricing of the chain stores, the staff also provides the personalized service you’ve come to expect and deserve. To find out more about Good Neighbor Pharmacy, go to www.myGNP.com . Bayshore Pharmacy is a two-generation, family-owned pharmacy operating in Atlantic Highlands for over 50 years. Providing medication counselling, delivery service, and a myriad of health services, Bayshore Pharmacy is your first stop on the journey to good heatlh. For more information, visitwww.BayshorePharmacy.com or www.Facebook.com/BayshorePharmacy . 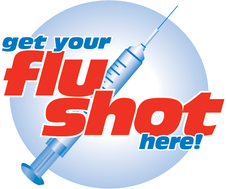 The Annual Flu Clinic will be held on Wednesday, December 10, 2014 from 10:00am - 12:00pm at the Senior Citizen Building in the Atlantic Highlands Marina. No charge for Medicare/Medicaid client, all others $20.00. Sponsoredby with Bayshore Pharmacy. 50 YEARS IN ATLANTIC HIGHLANDS! Mayor and Council, Employees (Former and Present), neighbors, relatives, and patients! Bayshore Pharmacy, Atlantic Highlands’ only pharmacy, is celebrating 50 years of serving the health and wellness needs of three generations of Bayshore residents with a gigantic 50th Anniversary Celebration on Saturday November 8, 2014 from 10am until 4pm. The celebration will include giveaways, Henry Hudson High School Music program performance and fundraiser, discounts, entertainment, food, and a special reception for three generations of past and present employees. The Stryker family never forgets that the family business is only possible thanks to the tight-knit community which they serve. “Working in the store has always been a privilege”, said Owner Richard P. Stryker. “From stocking the shelves I could barely reach when I was five or six years old while Mom did her food shopping next door to providing immunizations to neighbors and friends now, I have acquired an incredibly strong sense of community. That’s the reason we think it is so important to work with our neighbors whether it is raising donations for the local Food Pantry and High School, staying open in the dark after Superstorm Sandy, or just spending a few minutes with an overwhelmed patient who is just learning about her newly diagnosed diabetes. Richard C. Stryker and Joseph McDonald opened the pharmacy in 1964 when the shopping plaza was built on the highway. Born and raised in Atlantic Highlands, Mr. Stryker realized the need for a full-service pharmacy that could serve all the needs of the growing community. While the area’s population tripled, Bayshore Pharmacy expanded into a larger space in 1971 at the same location to accommodate the growing needs of a burgeoning community. Adding a card and gift shop to the store along with prompt delivery services, Mr. Stryker stayed at the forefront of the borough’s needs. Mr. Stryker’s son, Richard P. Stryker, and his partner, Scott Eagelton, took the reins of the pharmacy in the 1990 s. The pharmacy once again met the challenges of a new generation of patients and customers when it expanded again into its present 7,300 square foot at the same Foodtown plaza. Expanding the home health care and surgical supplies in addition to adding immunizations and Medication Reviews, the pharmacy continues to lead the area in heath care services and delivery. What's kept Bayshore Pharmacy going for 50 years? Bayshore Pharmacy has seen plenty of changes over the past 50 years, but the focus on customers remains the same. In the half-century since it first opened, many things have changed at Bayshore Pharmacy in Atlantic Highlands. Since its founding in 1964 by Richard C. Stryker and his brother-in-law, Joseph McDonald, the renowned pharmacy has grown from its original 1,800-square-foot "three aisles and a phone booth" footprint to a 7,300-square-foot full-service pharmacy with a card and gift shop, surgical supplies and more. And perhaps most tellingly, of the three other pharmacies located on or near the town's First Avenue, the owners have all since retired or moved on, leaving Bayshore Pharmacy as the last one standing. The store's capabilities have expanded tremendously too, from basic services in the 1960s to a full range of immunizations, medication management and collaborative health care support today, and store ownership transitioned to son Richard P. Stryker and business partner Scott Eagelton in the 1990s. But while so much has changed throughout Bayshore Pharmacy's 50-year tenure, one thing hasn't – the store owners' commitment to the community and desire to take care of their customers through all stages of life. "From the time I was 5 or 6, my mom would drop me off at the pharmacy in the morning and I would watch my dad work and help stock shelves," recalled Richard P. Stryker, 49, an Atlantic Highlands native whose grandfather was the town postman. One of four siblings, "I looked up to my dad and always wanted to be a pharmacist," said the current Middletown resident, who graduated from pharmacy school in 1989 and whose father, now in his 80s, still works at the pharmacy two nights a week. "I love working here, knowing so many of the customers who come in, and having the opportunity to take care of them every day," Stryker said. "People aren't dollar signs to us when they walk in the door and we really feel like we get a chance to make a difference in Atlantic Highlands and the surrounding area." Though the field of pharmacy has evolved over time, Stryker said that most of the changes have been for the better. Among those, "the use of computers and computerized records continues to be a big transformation in the industry and enhances the efficiency with which we can provide care," he said. Should Atlantic Highlands allow pet chickens? "We also have a much greater working relationship with area physicians than in the past; we always knew them but it became a more collaborative, team environment with the advent of increasingly complicated therapies and medications," Stryker said. "And patients are much more educated about their health care than ever before, too. "Years ago, for example, we weren't even allowed to put the name of the medication on the bottle unless the doctor allowed it based on the belief that it might confuse patients. Now, we want people to be as educated as possible, know their numbers, and know how to handle their conditions. It's great that people are taking care of themselves and asking questions," Stryker said. "Pharmacists aren't just those guys standing behind a big mountain of a counter anymore. We're much more accessible now." As much as it pleases Stryker that many of the pharmacy's employees have a long history with the store – co-owner Eagelton, for example, "worked here since college and was always a part of our family," he said – he's equally gratified to have served so many generations of families throughout Bayshore Pharmacy's history. Among those satisfied patrons is 25-year-long customer Cecilia Gorsegner, a 55-year-old Middletown nurse who now brings her 1-year-old granddaughter Dorothy to the pharmacy every Friday to pick out a new Sesame Street stuffed animal for the little girl's growing collection. "At Bayshore Pharmacy, they treat you like family, answer your questions, and are genuinely concerned about their customers," Gorsegner said. "It's personalized service and a very homey feeling, not like going into one of the chains. Once, Richard even opened the pharmacy after hours on a holiday to deliver prescription medication to my home when I needed it," she added. "You won't find that anywhere; that's what this pharmacy is all about." Proud to be able to "straddle that line of making medications to order in different flavors and offering delivery in the old-fashioned way of doing pharmacy, which is why we got into the business in the first place," Stryker said, Bayshore Pharmacy will celebrate its 50th anniversary on Nov. 8 with a full-blown open house featuring music, food, coupons and giveaways, and will also be helping to support the Atlantic Highlands Food Pantry and matching every donation that comes in. During this golden milestone, "the feeling is overwhelming and what we give and get back from our customers is so rewarding," Stryker said. "It's incredibly important for us to have this tradition in town and to be part of the fabric of our community." Hours: 8:30 a.m. to 9 p.m. weekdays; 9 a.m. to 6 p.m. Saturdays; and 10 a.m. to 4 p.m. Sundays.